We extends you a warm welcome to attend the CME Accredited 10th International Conference on Cardiovascular Research and Cardio Care which will be held on December 11-12, 2019 in Abu Dhabi, UAE. Cardio Care 2019 lays excellent platform for Cardiologists, Researchers, Scientists, and Academics etc. within the field of Cardiology. Our aim is to bring together the great minds to give talks that are research focused on a wide choice of topics to encourage learning, inspiration and provoke conversation that matters. This conference has been designed to provide an innovative and comprehensive overview of the latest research developments in Cardiovascular Research and Cardio Care. The Congress will provide enough duration for one to one as well as for group discussions, to provide a close connect with speakers and attendees. Many renowned professionals of Cardiovascular Research and Cardio Care will be a part of this Congress. We hope that you will enjoy the Congress and that your interaction with your colleagues from different regions of the world will stimulate a productive exchange of innovative ideas. So, we invite all the Doctors, Scientists, Professors and Researchers in the field of Cardiovascular Research and Cardio Care. Cardio Care 2019 aims to gather the Researchers, principal investigators, experts and researchers working under academia and healthcare industry, Business Delegates, Scientists and students across the globe to provide an international forum for the dissemination of original research results, new ideas, and practical development experiences. We hope that you will grasp this academic occasion to regenerate the stable relations and flash with new peers around the world. Meet the Global Inspiring Experts and Speakers at our Cardio Care 2019 to talk about on new advances in the field of Cardiovascular Research and Cardio Care to improve Cardiovascular Research and Cardio Care treatment. We invite you to join us at the Cardio Care 2019, where you will be sure to have a meaningful experience with scholars from around the world. All members of the Cardiovascular Research and Cardio Care 2019 organizing committee look forward to meeting you in Abu Dhabi, UAE. Cardio Care Conference recommends consciousness against Risk element variation around the cardiac diseases. The premier comprehensive source of cardiovascular services in the prevention, detection, management and treatment of the cardiovascular diseases. This annual cardiology conference is a stage for scientific work in the fields of cardiology, angiology, hypertension and cardiac and vascular surgery. It decreases medical procedures and premature death in people with cardiovascular disease risk. Cardiovascular disease is treatable with initial treatment primarily focused on diet and lifestyle interventions. The congress focuses on the treatment of diseases and new theories of diagnosis of the blood vessels and the heart or cardiovascular system. Cardiac Devices are electric devices for supporting cardiac circulation, which is used either too partially or to completely replace the function of a failing heart. The evolution of these wireless cardiac monitoring devices is marking a new era in medicine and a transition from population-level health care to individualized medicine in which suitable patients are equipped with advanced biosensors that, in turn, have their data processed through sophisticated algorithms to predict events before they occur. The pacemaker, defibrillators, biosensors are the heart devices used in treatment of heart diseases. Cardiac diagnosis is based on information from sources such as findings from a physical examination, interview with the patient or family or both, medical history of the patient and family, and clinical findings as reported by radiologic studies and laboratory tests. The diagnosis of heart can be carried out by various methods such as by Surgeries, electrophysiology, Imaging techniques, radiography, angiography, etc. Medicinal care is very vital once the heart disease is identified. The goals of treatment are stabilizing the condition, controlling symptoms over the long term, and providing a cure when possible. Diet, stress reduction, and lifestyle change plays vital role in managing heart disease, but the spines of conventional care are surgery and drugs. Hypertension is defined as the raise in the blood pressure level which might place the patient at an increased risk for target organ damage in several of vascular beds including Heart, Large Conduit Arteries and other main functional body organs (Kidney, Brain, and Retina). The risk of heart failure depends on the gender. The risk is generally increased by 2 fold in men and 3-fold in women. The uncontrolled and prolonged elevation of BP can lead to a variety of changes in the myocardial structure, Coronary Vasculature and Conduction System of the Heart. Cardiac nursing is a branch of nursing which specially deals with the patients who suffer from several conditions of the cardiovascular system. Cardiac nurses help treat conditions such as unstable angina, cardiomyopathy, coronary artery disease, congestive heart failure, myocardial infarction and cardiac dysrhythmia under the direction of a cardiologist. Cardiac nurses perform postoperative care on a surgical unit, stress test evaluations, cardiac monitoring, vascular monitoring, and health assessments. Cardiac nurses work in many different environments, including coronary care units (CCU), cardiac catheterization, intensive care units (ICU), operating theatres, cardiac rehabilitation centres, clinical research, cardiac surgery wards, cardiovascular intensive care units (CVICU), and cardiac medical wards. Cardiac regeneration is reparative undifferentiated cells that have the ability to restore function to damaged tissue by renewing cell growth in cardiovascular cells destroyed by heart disease or a rapidly advancing and controversial field of research. The identification some 12 years ago of progenitor cells that reside within the heart spurred enthusiasm for cell-based regenerative therapies and approximately 15.5 million Americans have one or more types of cardiovascular disease, such as heart attack, angina or heart failure. Heart regeneration strategy requires the injection of exogenous cells into the affected area of the heart. These transplanted cells could generate and repopulate the injured area with the myocardium. Complementary regenerative strategies to cell transplantation are simultaneously being pursued by the field. Cardiovascular surgery is also known as thoracic surgery operated on the heart or great vessels by cardiac surgeons and it is the field of medicine involved in surgical treatment of organs inside the thorax. There are 5 types of cardiac surgery are done to treat complexity of ischemic heart disease, congenital heart disease or treat valvular heart disease from various causes including endocarditis, rheumatic heart disease and atherosclerosis and advancement of cardiac surgery and cardiopulmonary bypass techniques has greatly reduced the mortality rates of these procedures. The surgery requires postoperative care to avoid complications. Laceration care is needed to avoid infection and minimize scarring. Swelling and loss of appetite are common. Coronary artery bypass grafting (CABG) is the most common type of heart surgery, CABG improves blood flow to the heart. Cardio-oncology includes the intersection of heart conditions in patients who have been treated for cancer. The cardio oncology is growing at a faster rate because the survivors after cancer treatment are more prone to cardiac disorders. The increase in cancer disease in the world has led to the emergence of numerous chemotherapeutic agents which are under preclinical or clinical studies. These agents are potent to cause damage to the heart (cardio-toxicity). Cardio-toxic effects of chemotherapy might be decreased by the concurrent use of angiotensin-converting enzyme (ACE) inhibitors, angiotensin receptor blockers or beta-blockers. The use of diagnostic imaging, non-invasive stress testing, serum biomarkers, ambulatory blood pressure monitoring and ambulatory cardiac telemetry can help to identify cardio-toxicities and lead to the development of preventive strategies. Heart failure is a condition in which heart can't pump enough blood to meet body's needs. Heart failure is a serious condition that requires medical care. If a person has heart failure, they may tire easily and have to limit their activities. CHD can lead to heart failure by weakening the heart muscle over time. Cardiology is a branch of medicine deals with the disorders of the heart. Heart is an important muscular organ in humans and other animals, pumps blood through the blood vessels of the circulatory system. The drugs that are used to treat other disorders in body show a great impact on heart causing various side effects. Hence case reports on cardiac arrest and diseases have a great value and help in progressing and advance of treatment methods. Cardiology is the branch of medicine which deals with the dysfunctions of the heart in humans or animals. The field includes diagnosis and treatment of heart failure, congenital heart defects, coronary artery disease, valvular heart disease and electrophysiology. It is a specialization of Physicians and internal medicine that specialize in this field of medicine are called cardiologists. 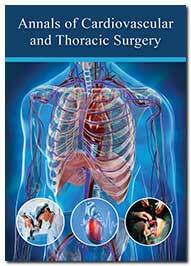 The Cardiothoracic surgeons or Cardiac surgeons are the ones who specialize in cardiology from general surgery. Although the cardiovascular system is inextricably linked to blood, cardiology is relatively unconcerned with haematology and its diseases. Some undeniable special cases that affect the function of the heart would be blood tests, decreased oxygen conveying capacity, and coagulopathies. Coronary heart disease is also known as the Coronary artery disease which means that the narrowing of the coronary arteries or accumulation of plaque inside the arteries which resize the coronary arteries. After the heart supplies blood with oxygen and nutrients, blood is carried by arteries to different body parts. The coronary arteries are vital as coronary arteries carry blood to the heart muscle. So, when the coronary arteries become narrower then blood supply reduced to the heart muscles. Obesity increases the risk for heart disease and stroke. It damages the heart and blood vessel system. It is also a major cause of gallstones, osteoarthritis and respiratory problems. Obesity is intimately intertwined with multiple health conditions that underlie cardiovascular disease including high blood pressure, diabetes, and abnormal blood cholesterol. In addition, weight gain is a frequent consequence of heart-damaging lifestyle choices such as lack of exercise and a fat-laden diet. Obesity also can lead to heart failure. This is a serious condition in which heart can't pump enough blood to meet body's needs. Having diabetes or pre diabetes puts one at increased risk for heart disease and stroke. One can lower its risk by keeping the blood glucose, blood pressure and blood cholesterol close to the recommended target numbers—the levels suggested by diabetes experts for good health. 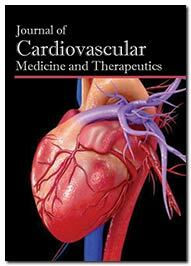 Stroke and coronary heart disease can be caused by the atherosclerosis. Heart arrhythmia is also called a cardiac dysrhythmia or irregular heartbeat. Heart arrhythmia is a condition where the heartbeat is irregular, too fast or too slow. Heart arrhythmia includes extra beats, Supraventricular tachycardia, ventricular arrhythmias and Bradycardia. Many types of arrhythmia have no symptoms. When symptoms are present these may include palpitations or feeling a pause between heartbeats. More seriously there may be light-headedness, passing out, shortness of breath, or chest pain, some predispose a person to complications such as stroke or heart failure. The interventional cardiology is the main branch of cardiology that refers the specific Cather based techniques to various structural heart diseases, non-surgical procedures for treating cardiovascular disease. Interventional cardiologists use catheters. It is thin, flexible tube to repair damaged vessels or other heart structures frequently avoiding the need for surgery. The most commonly procedures can be perform on heart by Catheterization. It involves the insertion of a sheath into the femoral artery and cannulating the heart under X-ray visualization. Cardiac catheterization is a test which used to evaluate the coronary arteries and heart valve function. Heart disease is the main cause of death in the world. 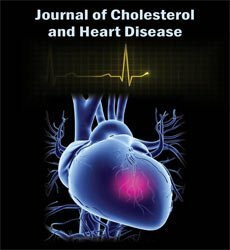 Nuclear Cardiology is the main reason for commencement of the diagnosis of heart disease and the assessment of disease extent and the detection of outcomes in the setting of coronary artery disease. Nuclear cardiology studies use non-invasive methods to analyses myocardial blood flow determine the pumping function of the heart as well as visualize the size and placing of a heart attack. Among the techniques of nuclear cardiology, myocardial perfusion imaging is the most commonly used. Paediatric cardiology is concerned with diseases of the heart in the growing and developing individual. As well as expertise in heart disease, paediatric cardiologists also need a thorough grounding in general paediatrics, to provide all-round patient care. Paediatric cardiologists broadly treat congenital heart disease, arrhythmias and disturbances of circulatory function. The initial assessment performed by the paediatric cardiologist might start with a physical examination using a stethoscope, after which more detailed investigations may be suggested. Patients often present with complex diagnostic and medical problems and after the initial assessment the paediatric cardiologist then chooses an optimal management plan. They work closely with a wide range of specialists as part of a multidisciplinary team to assess and treat patients. Regenerative medicine and stem cell research have tremendous potential to revolutionize the treatment of cardiac disease. Stem cells are nature’s own transformers. When the body is injured stem cells travel to the injured site and heal the tissue. Current drug therapies slow the progression of heart failure but are not curative and heart transplants can only be offered to a very limited number of patients. The heart has a limited ability to regenerate damaged tissue after a heart attack. Cardiac stem cells have the potential to differentiate into all the cells that make up the heart, including heart muscle cells, smooth muscle cells, and endothelial cells. Both embryonic stem cells and induced pluripotent stem cells, mature cells that are manipulated back to a stem cell state that can be harnessed to create new heart cells. The difficulty is that the heart cells made with stem cells resemble the heart cells of an infant, rather than adult heart cells. To function in adult hearts, the new heart cells must mature and then be able to survive within the constantly beating environment of the heart. At the HSCI, researchers are focused on understanding how to take these new heart cells all the way to maturity and stability so they can be used as an effective therapy. 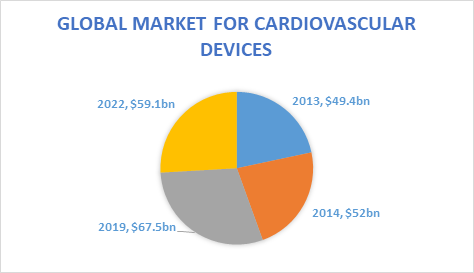 The global market for cardiovascular devices reached nearly $45.74 billion in 2018 and estimated to reach $59.1 billion by 2022, at a compound annual growth rate (CAGR) of 6.9% for the period of 2018-2022. 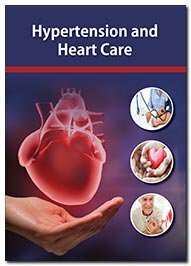 The cardiovascular disease market, which includes various numbers of disorders like coronary artery disorders, dyslipidaemia, hypertension, cardiac arrest and thrombotic events, is set to grow from $136.57 billion in 2018 to $146.4 billion by 2022, at a very modest compound annual growth rate of 1.8%, according to business intelligence provider GBI Research. Novartis heart-failure drug Entresto was introduced to the market in July 2015, and GBI Research expects its revenues to increase dramatically during the forecast period. Entresto is a combination drug, which has shown efficacy in clinical trials. Coupled with a high cost, which amounts to over $4 500 annually per patient, the drug contributes to a very high revenue forecast of $5.7 billion by 2022. Cardiology is a branch of medicine deals with disorders of the heart. It is a forever rising branch in the arena of medicine. It includes medical diagnosis and treatment of Coronary Artery Disease, Heart Failure, Valvular Heart Disease, Electrophysiology, Inherited Heart Disease and Congenital Heart Defects. Mainly due to the lifestyle and improper hygiene both young and old are affected to heart disorders. In order to tackle these diseases and its causes, the study of Cardiology has gained high importance in the course of time. Abu Dhabi is forenamed to be the top created place for the field of cardiology. Emirates Cardiac Society and World Society for Pediatric and Congenital Heart Disease in Abu Dhabi is the most found of cardiology research and prominent in field of cardiology. Cardio Care 2019 is going to be held in Abu Dhabi. Abu Dhabi is the capital and the second most populated city of the United Arab Emirates and also capital of the Emirate of Abu Dhabi, the biggest of the UAE's seven emirates. Abu Dhabi International Airport (AUH) is the main flying hub of the city and the second fullest airport in the UAE. to request for a personalized letter of invitation, if not received until one month before the scheduled date of event.